Our herbal formula Green Peez prevents brown spots on grass caused by dog urine. Containing nothing but traditional herbs known to support the urinary tract, Green Peez has no side effects apart from a beautiful lawn. How does Green Peez Work? Green Peez contains the highest quality herbs and is made here in the UK. All of the herbs used in Green Peez are known to contribute to a healthy urinary tract. Burdock Root - enhances the performance of the kidneys to help purify and eliminate toxins. Dandelion - traditonally used to support the kidneys and to fight urinary tract infection. Goldenrod - used to fight bladder inflammation, kidney stones and urinary tract infections. Yucca - binds the ammonia in urine and cleanses the kidneys and liver. It is also an anti-inflammatory. Unlike other products on the market, Green Peez is added to food not water on a daily basis so unless your dog refuses their dinner (! ), you can be sure that your dog is getting his/her full daily amount every day. 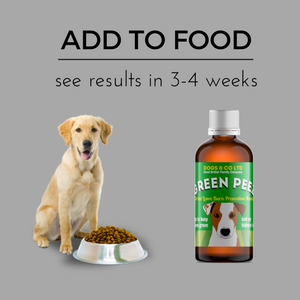 Once you start giving Green Peez to your dog, allow around 2-3 weeks, depending on the time of year for the formula to get into your dog's system. Green Peez will not get rid of existing brown patches. This is dead grass and will need to be re-seeded in the fullness of time. However, it will prevent further brown patches appearing. Read what our customers say about Green Peez in the reviews section of our website.